Australia has created so few jobs in the past three months that at the present rate it would take a quarter of a century to reach the 500,000 promised in the budget. On budget night in May treasurer Wayne Swan promised a half a million new jobs in two years. One quarter of the way in to the first of those financial years the total is 5300. At that rate Mr Swan or a successor would deliver the promised half million in January 2035, more than two decades late. So sudden has been the collapse in the jobs outlook since the May budget that many of its other forecasts are in doubt, including those for revenue and a return to surplus in 2012-13. The estimate of 5300 new jobs is generous. Until a jump of 20,400 new jobs in September the total was running backwards. The smoothed trend preferred by the Bureau of Statistics shows just 3200 jobs were created in the first three months of the financial year, a pace that if continued would see the government fall short of its target until 2050. The figures show the jobs market was crumbling in May as the government released the budget. With most of the financial year already complete the budget predicted jobs growth of 2.75 per cent for the year to June. Jobs grew 2.2 per cent. For the current financial year it predicted 1.75 per cent. So far jobs growth is running at an annualised 0.2 per cent. Jobs minister Chris Evans said the 20,400 boost was “double market expectations”. But the Bureau warned against taking the monthly result seriously saying the nature of its survey meant it could only be confident the true result was somewhere between a loss of 34,400 jobs and a gain of 75,200. 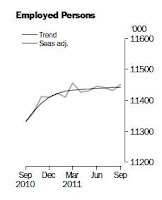 The trend measure that it prefered shows next to no jobs growth. Financial markets surged on the apparent good news believing it made a November rate cut less likely. The dollar jumped to a a three-week high of 101.89 US cents and futures traders cut the implied probability a rate cut next month from 100 per cent to 74 per cent. The Reserve Bank’s decision next month will probably have more to do with the inflation figures due in a fortnight than it will with employment figures that remain close to flat. Westpac economist Justin Smirk charaterised the blip in jobs growth as “statistical noise you would expect in a soft labour market that does not have a strong trend”. The apparent dip in the unemployment rate from 5.3 to 5.2 per cent is the result of rounding. It remains close to 5.25 per cent. Weighing heavily on jobs growth is much slower population growth which depresses both the supply of workers and demand for their services. As high as 2 per cent in late 2009, population growth has slipped to 1.4 per cent per year, the lowest rate in half a decade. Only in Western Australia and Queensland is jobs growth strong. Since the start of the year combined they have put on an extra 25,000 jobs - 80 per cent of the national total. NSW has lost 11,000 jobs; Victoria has gained 15,200.
. Employment. What if it hasn't stopped growing? This Tax Summit, how's it look?